What is CoEnzyme Q10 and how does it affect me? A good analogy for the role that CoEnzyme Q10 plays in the human body is a spark plug in a car engine. Just as the car cannot function without that initial spark, the human body cannot function without CoEnzyme Q10 (abbreviated as CoQ10). CoQ10 is sometimes called Vitamin Q, but is also known as Ubiquinone because it is found in every plant and animal cell. It is an essential component of mitochondria, the energy producing unit in our bodies’ cells. CoQ10 is involved in the manufacture of adenosine triphosphate, which is the energy currency of all body processes. CoQ10 helps to increase energy levels, supports the immune system, provides a positive effect on many organ systems, and promotes heart health and oral health. Numerous clinical studies have shown that increased basal blood CoQ10 levels also provide support during times of physical stress and illness. Why should I supplement my diet with CoQ10? Since the discovery of CoQ10, investigation into its clinical value led to widespread use as a supplement and substantiation of its benefits for human health. Although our bodies synthesize CoQ10, our ability to do so diminishes over time. The amount of CoQ10 that comes from dietary sources may be insufficient to maintain basal blood levels of CoQ10 that our bodies need for healthy functioning. Age, improper diet, drugs, and various lifestyle choices can deplete CoQ10 levels. Recent clinical data shows that CoQ10 is beneficial for those taking statin cholesterol-lowering pharmaceuticals for hypercholesterolemia because statin drugs in long-term use decrease CoQ10 production in the process of lowering the production of “bad” cholesterol. CoQ10 supplementation can act as an adjunct while taking these statin medications. 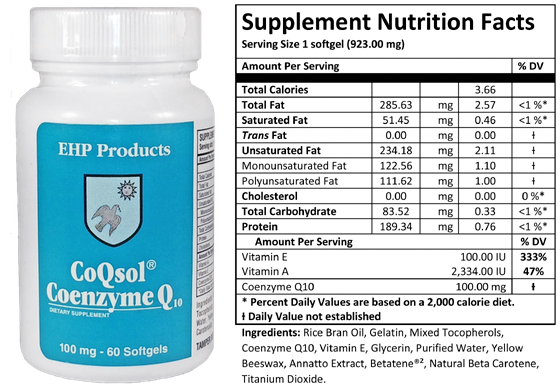 What is special about EHP Products’ CoQsol® CoEnzyme Q10? Dr. Karl Folkers, who was awarded the prestigious Priestly Medal of the American Chemical Society in 1986 for his research into CoQ10 and other nutrients, criticized powder CoQ10 products as not being readily absorbable by the body. CoQ10 is soluble in fats or lipids and his position was that the powdered form of CoQ10 was inferior in that it was not very bioavailable. In keeping with Dr. Folkers’ position, EHP Products offers CoQ10 in an oil form called CoQsol®. CoQsol® was clinically studied in humans and demonstrated superior absorption over CoQ10 powder in hard shell capsules. If you are interested in details on the clinical studies, we would be more than happy to send you that data. The superior ability of CoQsol® to increase basal blood levels of CoQ10 is what sets it apart from competing products in powder form. Moreover, our CoQsol® softgels are 100 mg strength, not the 10-30 mg strength offered by other distributors.